Dr. Robins is a professor in the Departments of Medicine and Human Oncology at the University of Wisconsin School of Medicine and Public Health, Madison, WI. 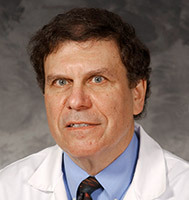 He is board certified in internal medicine and medical oncology and is a Fellow of the American College of Physicians. Dr. Robins is a nationally and internationally recognized investigator in the area of neuro-oncology and has served as a principal investigator on various NIH/NCI cooperative group protocols, and continues to have NIH grant support. He is currently listed among Best Doctors® in America and America’s Top Doctors for Cancer. He participates in the Radiation Therapy Oncology Group, the Eastern Cooperative Oncology Group and Alliance Oncology and is on the executive neuro-oncology committees of these groups. He has published over 240 peer reviewed papers, over 40 books and chapters and 220 abstracts. Much of his clinical activity relates to an interdisciplinary neuro-oncology clinics located in the Radiation and Medical Oncology Departments. Dr. Robins is an active investigator in the area of neuro-oncology. He has been in the past and is currently a principal investigator on various cooperative group protocols, including the North American Brain Tumor Consortium (NABTC), Eastern Cooperative Oncology Group (ECOG) and Radiation Therapy Oncology Group (RTOG).